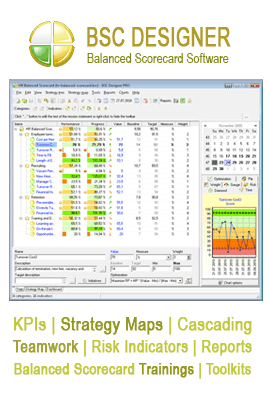 We discussed the process of designing great indicators in the eTraining, “How to Design Winning KPIs”. In this bonus mini-lesson, we will review some basic ideas about designing Key Performance Indicators. 1) Who should design your indicators? You should involve at least two people: a top manager, who understands the company’s strategy and goals; and a line-level manager, who knows what can and should be done to achieve those goals. 2) Do you have good indicators? There are two rules to remember. Your indicators should not repeat each other, but taken together, they should describe 90% of your company or business unit. 3) Are your indicators easy to measure? Your indicators should be easy to understand and measure, or your employees will not use them. So first, try measuring each indicator yourself. Then, ask a colleague for an independent opinion. If your colleague needs a significant amount of time to understand the indicator, then it is not a good indicator. Either remove it from your scorecard, or clarify its description. 4) How many indicators? Keep the number of indicators low. Ideally, you should have three or four indicators in each category. If you have more, you are overloading your scorecard. Either add sub-categories, or create a Cascading Balanced Scorecard.